The Pearl Flip comes with the latest version of the BlackBerry OS, which has thankfully been refreshed. 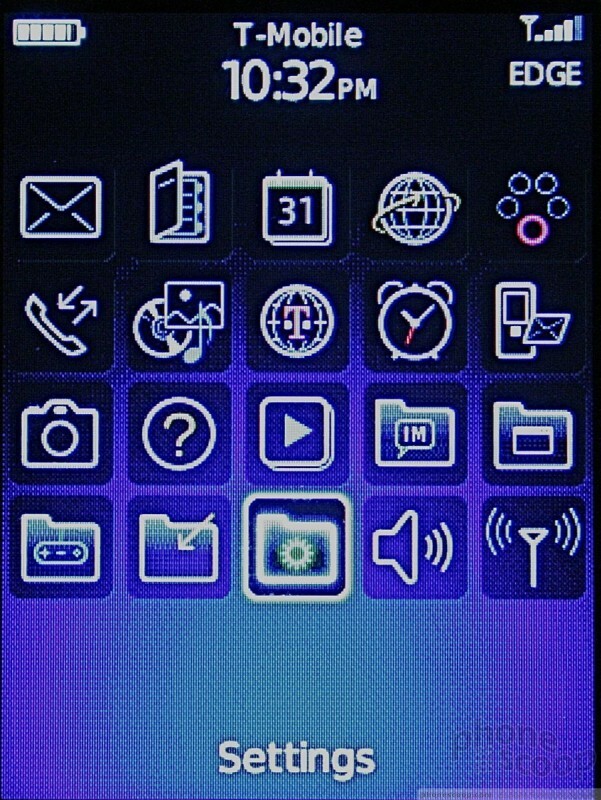 It uses all new icons and colors to signify everything and the new theme is called Precision. 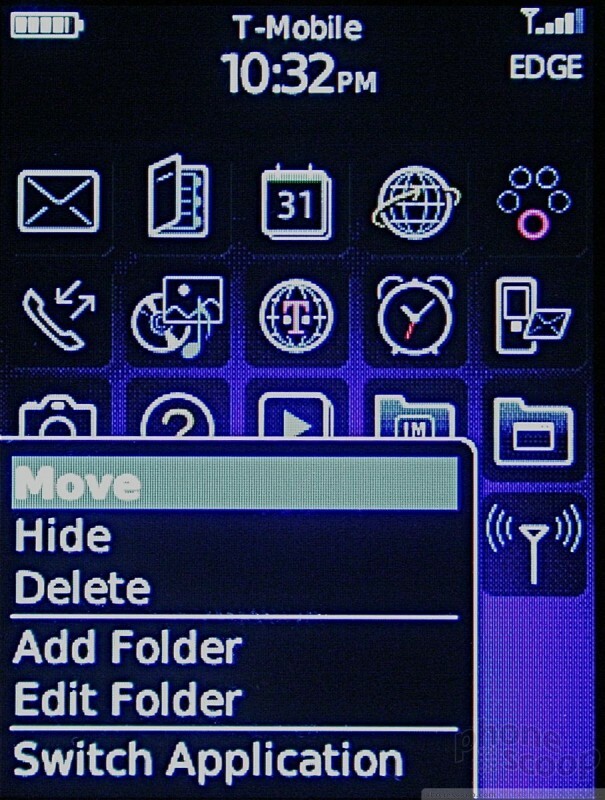 Out of the box, the basic appearance of the home screen includes your T-Mobile MyFaves in the center of the screen, with a row of five icons running along the bottom. Scrolling the trackball left or right cycles through your MyFaves. If you want to get to the five icons below, you have to scroll down first, and then left or right. These five icons are shortcuts to Messaging, Contacts, Calendar, the Browser and your faves. Hitting the BlackBerry key - as on all BlackBerries - is where the magic takes place. This button brings up the full menu on the Flip. Here you'll find a grid of 20 icons representing all of the phone's functions. The icons are mostly intuitive and you can figure them out easily enough. Drilling down beyond this set of icons, though, and things start to look more familiar. The underlying architecture of the BlackBerry OS is the same, which mean menus, menus, and more menus. If you want to do anything, hit the BlackBerry key, and a long list of action items appears. Most often, RIM's software automatically highlights the selection you're probably most interested in. For example, if you tap the BB key when browsing the web, the Web menu appears, and the "Go To Web Page" action item is automatically selected. The one thing I noticed with the Flip was a bit of a lag. You'd press the trackball to access an application or menu, and there would be a small delay before that app or menu opened or loaded. In all, though, the BlackBerry menu system is easier than ever to figure out. Our report from the fall CTIA trade show in San Francisco. Hands-on with the latest from HTC, Samsung, Velocity, BlackBerry, LG, Kyocera, PCD, and Motorola. Samsung today said a black pearl version of the Galaxy S7 Edge smartphone will go on sale in select markets starting December 9. The black pearl color will only be available with 128 GB of storage, which means the price will be in the neighborhood of $870. BlackBerry said this week that it will no longer provide monthly system and security updates to its BlackBerry Priv smartphone. The company originally committed to providing updates for a period of two years. BlackBerry today said it will cease manufacturing the BlackBerry Classic handset. The Classic debuted in December 2014 and is one of the last devices from BlackBerry to run BlackBerry OS. TCL, the parent corporation of Alcatel, unveiled its new handset strategy moving forward. The company will continue to build its Alcatel-branded smartphones that target the low/value end of the market.